Welcome to my first post for Our Daily Bread Designs’ Shining the Light challenge! Starting today I’ll be joining the very talented and inspiring challenge team at ODBD every week. Words fail to express how grateful and excited I am. This challenge was one of the very first I joined when I opened my blog, and this team has been incredibly supportive and kind always. So it is a great priviledge to be part of this beautiful group of ladies! Thank you Kelley for your kind invitation and thank you teammates for your warm welcome and support. This week’s challenge is a sketch and below is the card I made inspired on it. This month’s new release at ODBD is filled with beautiful stamps about worship. I used the new stamp set called Music Speaks. I felt quite inspired, since a great part of my life was devoted to serving in worship teams. While I was making my card a beautiful song came to my mind spontaneously, a song I had not heard in years. I am sharing it with you, so you can enjoy it too! 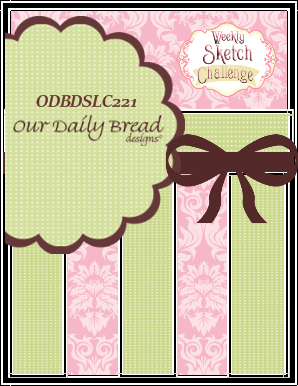 To see all the projects created for ODBDSLC221 or to join the challenge click here. You have until January 11, 2015 at 8:00pm EDT to join us. By participating in the challenge, you have a chance to win a $15 ODBD Gift Certificate good towards the purchase of stamps in the “stamps column” on the ODBD website, or to be spotlighted on the ODBD Blog at our next challenge. The random prize winner will be posted on our next challenge post. I hope you enjoyed today’s post. I look forward to seeing what you come up with for the challenge this week! Thanks so much for stopping by! Welcome, Gracie! LOVE how you used the border dies – so clever! Love the colors and all the rich details too! Welcome to the CT, Gracie!! I just love how you stamped the background with the bird and musical notes, all the textures with the border die for your panels, and the sheer elegance. So many gorgeous details!! Stunning work my friend! Congratulations Gracie! I am so happy for you. Your card is gorgeous, love the colors and dies you used. Congratulations on your new DT and well deserved! 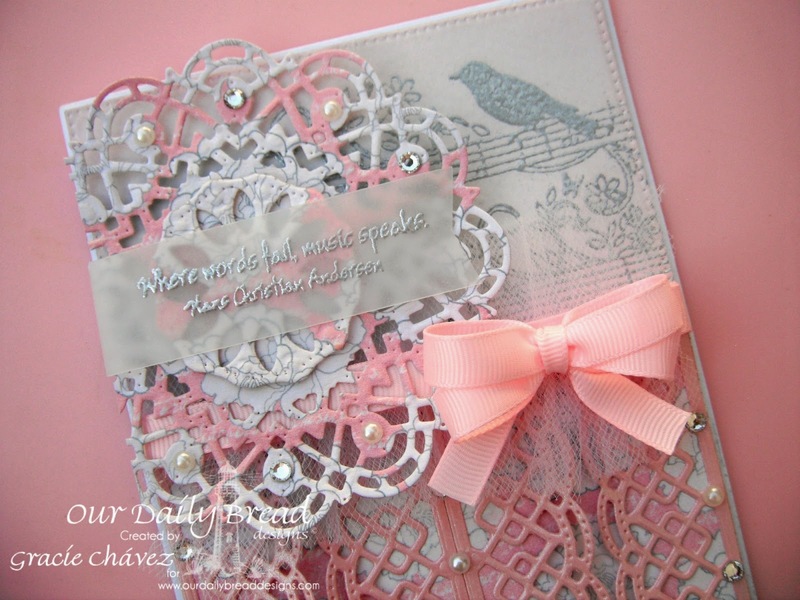 Beautiful card – your die cuts are so pretty! Well first off, welcome to the team! Happy New Year and what a way to start it off!! I love your cards and this one is no exception!! You did a gorgeous job interpreting the sketch!! I love the all around lacy look of your card and I love the colors! The bird in the corner is so sweet and love the tulle with the ribbon bow! Awesome first post for ODBD!!! Congratulations on becoming DT. You truly deserve it. Your card is so beautiful. Love the soft colors. Hi Chris, welcome to the team. A beautiful card with soft colors and texture. Welcome to the team, Gracie, it's so exciting to see all of your gorgeous creations!! Love this one with the beautiful layers and wonderful embossing on vellum, so pretty!! First of all, congratulations on your DT spot with ODBD! That is just awesome. Although, I'm not surprised at all as your cards are so elegant and are full of gorgeous detail. This one is no exception. Very stunning. Congrats on the DT! I love how your works are so stunning and am so happy to be following you, hopefully some of your works rub off on me! Welcome to the team Gracie! Your card is absolutely gorgeous! Love the colours and love how you've used all the dies – so creative and talented! Thanks for sharing the song too – I haven't heard that one before. Beautifully done, Gracie! Just love your take on the sketch and love the soft colors! Hugs!